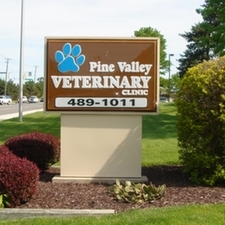 Pine Valley is celebrating 40 years of business in July of this year! Established in July of 1979 in a leased space in the Pine Valley Mall, the clinic moved to its second location in May of 1990. On December 26, 2007, the move to our current location was completed. We strive to offer not only sound advice, but also optimal veterinary care, allowing you the enjoyment of your companion for a maximum number of years. Our job is not only to treat your pet when he or she isn't feeling well, but also to keep your best friend happy and healthy through preventative medicine. We are members of the Cat Friendly Practice Program by the American Association of Feline Practitioners. This is our way of assuring that our facility and our staff are dedicated to reducing stress and increasing quality of care for our feline patients.